More than 50% of students in the TDSB speak a language other than English at home. While some English language learners are new to Canada, others start learning English when they begin school. We offer a variety of programs and services for English Language Learners. Most students can read and write in their first language when they arrive in Canada but may have limited English skills. English as a Second Language (ESL) and English Language Development(ELD) programs help students learn English so they can participate fully in the curriculum and school life with their English-speaking classmates. 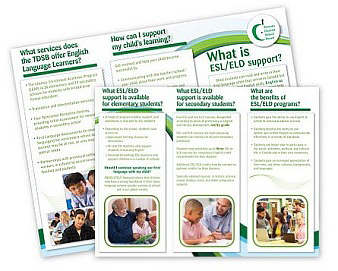 English Language Development (ELD) programs are for students who have had limited prior schooling and have not had the opportunity to develop age-appropriate skills in any language. Toronto District School Board has two Newcomer Reception Centres: West End Reception Centre and Georges Vanier Reception Centre. All students eligible for secondary school (ages 14 - 20) will visit one of these two Reception Centres before registration at their local secondary school. There are two Newcomer Reception Centres. Please access the location that is most convenient for you by calling to make an appointment.